... in a really awesome way! I'm super excited to try Beyond Meat's new "Beast Burger" as soon as it hits stores (I've been cooking with their "chicken" strips for the past year, and they are great!) 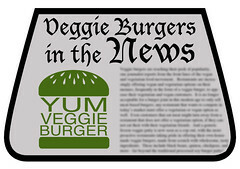 but I am even more excited about this challenge to mainstream burger chains, and what it could mean for the future of vegetarian options on restaurant menus!